Socotra was tried only by a few kite surfers, though the place deserves attention. Cindy Mosey, the World Kitesurfing Champion of 2003, was on Socotra the summer before last. A small video clip will give you an idea of the wind currents of summer monsoons. In summer the northern coast is blown by gusty winds. 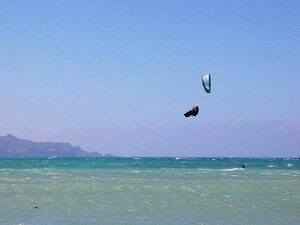 Cindy was kite surfing in Mahferhin located in the south-eastern part of the island, where winds are not so strong. To get an idea of the summer winter situation click here. We would recommend kite surfers to come to Socotra in autumn and winter seasons, when moderate north-eastern breezes make it favourable to go kite surfing in such beautiful places as Detwah lagoon (calm sea) and Delisha (breaking waves). If you are a kite surfer and plan to visit Socotra just write to us and we will prepare a special program for you to go kite surfing in the most interesting places of Socotra.